Freightliner’s new Cascadia will now be offered in a 60-inch raised roof sleeper model in both 116- and 126-inch BBC platforms – adding to the number of configurations available for the groundbreaking truck model. 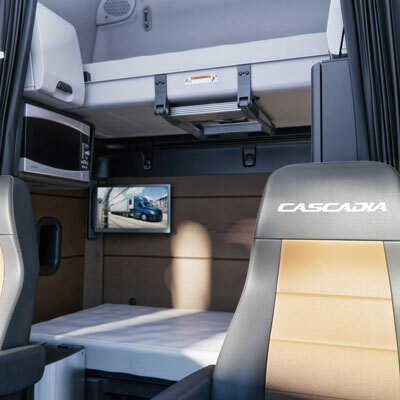 This marks yet another cab configuration announced for the new Cascadia in the past two months. At the North American Commercial Vehicle (NACV) show in September, Freightliner Trucks announced 48-, 60- and 72-inch mid-roof XT sleeper cabs in both 116- and 126-inch BBC platforms. Those models are designed for regional overnight haulers and bulk haul and flat-bed applications. The new 60-inch raised roof sleeper’s interior features a lower bunk with storage underneath, and a choice of either a cargo shelf for additional storage or an upper bunk with a telescoping ladder, providing easy access for team drivers. There is also a longer wardrobe cabinet for hanging clothes, a large microwave cabinet, an optional flat-panel TV bracket and an area for customer-supplied refrigerators or coolers. For maximum fuel efficiency, the new 60-inch raised roof configuration is available with either Aero or AeroX aerodynamic packages. It features the Integrated Detroit Powertrain (IDP) with either a DD13 and DD15 engine, as well as the DT12 transmission with Intelligent Powertrain Management (IPM4), and Detroit axles with axle lubrication management (ALM). The new configuration is also available with Cummins X15 engines and Eaton® Fuller Advantage transmissions. Customers can now place orders for delivery of all cab configurations in January. They can also digitally configure the interior and exterior at freightliner/configurator. Since the new Cascadia debuted in September 2016, Freightliner Trucks has received over 30,000 orders, topping the total number of orders for the first three years after the original Cascadia debuted. The new Cascadia has earned praise as Freightliner’s most productive, fuel efficient, and driver-friendly truck. • One-piece windshield designed for improved visibility. It also uses asymmetric glass construction to reduce chipping and cracking, and it is roped-in for ease of installation and increased uptime. • LED-lit interior and exterior lights, making the lighting system more maintenance-friendly. • Ergonomic dashboard with a layout that helps drivers easily access gauges and switches. • Detroit Connect Virtual Technician and Detroit Assurance 4.0 suite of safety systems that seamlessly integrate into the new Cascadia, providing enhanced fleet management while increasing uptime.